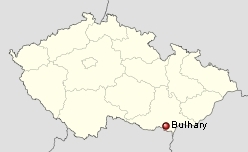 Pulgram (Pulgern, now Bulhary in the Břeclav District of the South Moravian Region, Czech Republic; coordinates: 48° 49' 53" N, 16° 44' 55" E), a village about 10 miles east of Nikolsburg (now Mikulov) in Moravia, situated on the Thaya River, belonged to the Nikolsburg domain of Liechtenstein. In the period of persecution of 1535 Hans Tuchmacher or Amon gathered the Anabap­tist brotherhood "between Nikolsburg and Pulgern in the Föhrenwald," and secretly administered the "glorious and beautiful memorial of the Lord's Sup­per with great peace." When persecution subsided, a group of Philippites settled in Pulgram; in the fall of 1538 they joined the Hutterite Brotherhood, whereby the latter came into the possession of a stately Bruderhof which included "the bake house, also the great house in which the school was located, the smithy, and the new house below the smithy." Other build­ings were soon erected. But in the next year danger threatened under the pressure of royal decrees. Amon wrote that the Brethren were about to be expelled from Pulgram, "and the sick and the children put out without pity." In 1545, on a shallow pretext but with the consent of the authorities, a quantity of cattle, leath­er, and wine were taken from them; in 1547 the great persecution brought with it greater damages. In 1551 the preacher Peter Hag died here, who was one of the Brethren taken to the galleys from the Falkenstein castle, but managed to return home and memorialized his fate in a song. In this year also, with the silent consent of the government, the settlement was robbed of much goods by a butcher Kunther and his associates, and the Brethren driven into the forest for a time. Later they prospered and were even able to lease a dairyfarm from the Nikolsburg lords. In 1591 Siegmund von Dietrichstein expelled them and also the Swiss Brethren from Bergen and Voitelsbrunn. Some of them settled in Wastitz, and others in Sobotište. In 1619 Dampierre's troops quartered in Pulgram and severely damaged the Bruderhof at Neumühl. Hege, Christian and Christian Neff. Mennonitisches Lexikon, 4 vols. Frankfurt & Weierhof: Hege; Karlsruhe: Schneider, 1913-1967: v. III, 410 f.
Loserth, Johann. "Der Communismus der mährischen Wiedertäufer im 16. and 17. Jahrhundert: Beiträge zu ihrer Lehre, Geschichte and Verfassung." Archiv für österreichische Geschichte 81, 1 (1895): 190. Wolny, Gregor. Kirchliche Topographie von Mähren II: Brünner Erzdiözese II. Brno, 1858: 93. Dedic, Paul. "Pulgram (Jihomoravský kraj, Czech Republic)." Global Anabaptist Mennonite Encyclopedia Online. 1959. Web. 23 Apr 2019. http://gameo.org/index.php?title=Pulgram_(Jihomoravsk%C3%BD_kraj,_Czech_Republic)&oldid=146072. Dedic, Paul. (1959). Pulgram (Jihomoravský kraj, Czech Republic). Global Anabaptist Mennonite Encyclopedia Online. Retrieved 23 April 2019, from http://gameo.org/index.php?title=Pulgram_(Jihomoravsk%C3%BD_kraj,_Czech_Republic)&oldid=146072. Adapted by permission of Herald Press, Harrisonburg, Virginia, from Mennonite Encyclopedia, Vol. 4, pp. 231-232. All rights reserved.